Oxford: 2011, - 727 p.
Oxford Preparation Course for the TOEFL iBT Exam is a communicative, theme-based approach to learning the skills needed to take the TOEFL Internet-based Test (iBT). Activities incorporate thorough explanation and practice of the four skills tested on the TOEFL. This multimedia program integrates the student book, audio CD, DVD, and interactive website. Within each thematic chapter, there is a selection of academic topics from the four TOEFL-tested subject areas of Life Science, Physical Science, Social Science and Arts. With this multi-disciplinary approach, students sample the range of topics addressed on the exam and yet feel a sense of cohesion in their study. Skills introduced in each chapter are reinforced through varied and engaging readings, audio recordings, and videos. The academic-skills approach combined with high-interest, thematic academic content allows for better retention of information and makes for a better classroom text that keeps students interested.As well, the approach to skill testing in the book is in-line with the Educational Testing Service's (ETS) pedagogical approach to the TOEFL, with a heavy focus on the Academic Word List. In order to increase students' comprehension of tested material and improve their test scores, Oxford Preparation Course for the TOEFL iBT Exam includes a complete answer key that explains the reasons why each answer is correct or incorrect. Two complete practice tests are available on the book's companion website. 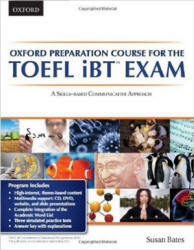 The Oxford Preparation Course for the TOEFL iBT Exam DVD contains lectures and authentic content to enliven the classroom and make instructors' jobs easier. The Oxford Preparation Course for the TOEFL iBTExam contains thematic content that will appeal to students with a wide range of interests. The text teaches the key skills for exam success through a communicative approach that reflects current methodologies designed to maximize language acquisition. Dynamic, meaningful topics reflect disciplines that students will encounter in post-secondary academic studies and offer both students and instructors an opportunity to engage in meaningful research and thought-provoking discussions. Multimedia support brings (he program to life: authentic, high-interest DVD content and interactive PowerPoint presentations keep students focused and interested in the teaming process. The companion website provides students with valuable practice opportunities, and six audio CDs complete the program with content that reflects the actual TOEFL exam. This program has many advantages:All 570 word families from the Academic Word List are studied in context. • Exam tips assist in ensuring students attain the highest possible TOEFL score. • Step-by-step instructions and summary charts clearly outline the best approach to each type of question. • Exam-specific skills—including note-taking, speed reading, paraphrasing, and summarizing—are reinforced throughout the text. • Students are given ample opportunities to sharpen their skills by completing practice exercises and three practice tests. • Includes contextualized skills instruction that is essential for success at colleges and universities.